As part of our continuing commitment to HVAC education, Contemporary Controls will be participating in the College of DuPage HVACR Network Day on April 24. The event is a chance for the newest members of the industry to see building automation products and talk to the engineers that design them. It also provides faculty members with the opportunity to hear about the latest innovations in the field. "The goal of HVACR Network Day is to bring industry and education together to help develop our workforce and strengthen the College of DuPage's impact upon the community," said Bob Clark, HVACR Coordinator at College of DuPage. The HVACR program at College of DuPage already uses our BAScontrol series and Sedona Application Editor for training purposes, so the students and staff are familiar with our products. This year, we're excited to introduce our recently released a BASpi I/O board for Raspberry Pi, which turns the already powerful Raspberry Pi3 into an extremely capable control device with web-based configuration, universal IO, and industry standard data communication and control protocol – BACnet. Because the BAScontrol Toolset supports the BASpi, users can access the powerful Sedona Application Editor (SAE) to learn how to set-up, program and maintain a DIY controller. 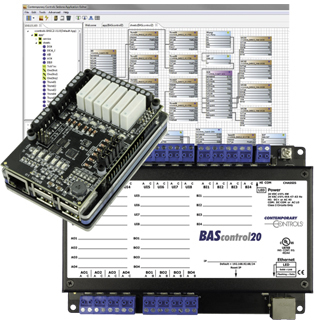 "The open hardware and free software tools make the BASpi a perfect automation and control trainer, whether on the workbench or in the classroom," said Zach Netsov, Product Specialist at Contemporary Controls. To learn more about using our BAScontrol series for training purposes, download Building Automation Training with BAScontrol22 (PDF).